Oh, there was a prequel to Dumb & Dumber in which neither Jim Carrey nor Jeff Daniels appears? Literally no one’s prayers have been answered. Dumb & Dumberer is the stuff of direct-to-DVD hell, yet it somehow got released in theaters. It also made a profit, which is astounding even with its relatively small budget of $19 million. I don’t think anyone would be (or should be) proud of their involvement in this. Actually, I take that back. The younger, lesser known actors who appear here probably gained a lot of valuable on set experience. It’s one thing being an extra, but it’s quite another to be a starring or supporting cast member. Although this is terrible, it probably did teach them some professionalism: showing up on time, knowing your lines and marks, etc. I imagine a lot of established actors have a few early lemons on their resume that they wish they could forget, but they would probably admit they were valuable learning experiences. But anyone more established should probably fire their representation. I’m looking at you, Eugene Levy, Cheri Oteri, Mimi Rogers, and Bob Saget. You can do better. This film is an abomination. I really don’t know how film producers could watch a screening of something like this and think it is fine for mass distribution. 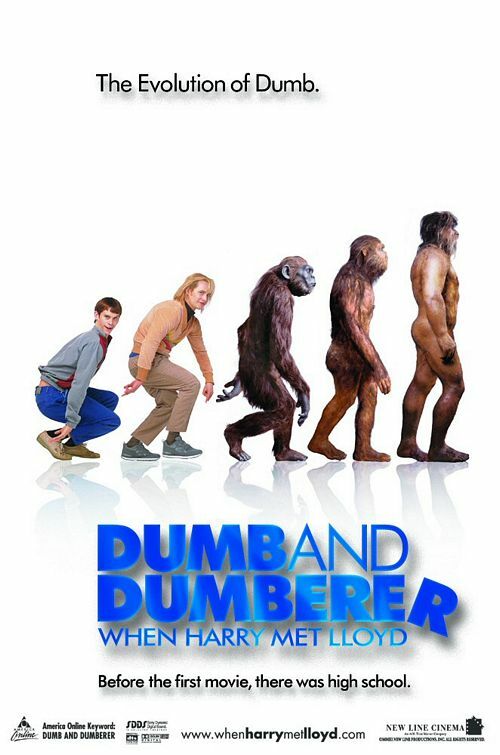 This prequel to the awesome Dumb & Dumber follows Harry (Derek Richardson) and Lloyd (Eric Christian Olsen) during their high school years where they first meet up. Lloyd is the son of a janitor (Luis Guzman) who lives at the school, while Harry lives at home with his single mother (Mimi Rogers). Their school principal (Eugene Levy) and his lover (Cheri Oteri) come up with a convoluted plan to milk money from the school board by setting up a fake special needs class. They find the school’s dumbest kids (Harry and Lloyd) and ask them to find other dumb kids to join the special needs class. The boys gather up their other idiot friends and join this class while their principal reaps the incoming school funding. The boys eventually get some help from wannabe journalist, Jessica (Rachel Nichols), who helps them put a stop to the principal’s fraud. It’s never really explained why Levy didn’t just create a real special needs class. This is a large high school, I’d be very surprised if there weren’t enough handicapped kids to at least fill a classroom. This is one of the many plot holes in this film, something I can usually overlook, provided the film is at least a little bit funny. It isn’t, this film is terrible. The biggest problem with it is that when the film tries to be funny, it fails miserably. The few times I laughed were when the film wasn’t trying to be funny at all, it seemed like the comedy was just dumb luck, and it was ruined shortly after when Eric Christian Olsen would try and impersonate Jim Carrey again. The film’s biggest problem comes from when Olsen just thinks doing a third rate job of impersonating Jim Carrey is enough to get some laughs. It isn’t. Carrey has something about him that this guy just doesn’t have. In the end, he comes off looking like a dork who in a C grade teen comedy. Which is exactly what this film is. Derek Richardson doesn’t try to impersonate Jeff Daniels, he just isn’t very funny. The only time I had any fun was when I was star spotting. Rachel Nichols is someone I really like and definitely worth following on Twitter. She has a great sense of humor, but this is one of her earliest roles and although she tries hard, the script doesn’t help her at all. I also spotted a young Shia LaBeouf as one of the fake special needs kids. This would have been back in his Even Stevens days I think, so I’m surprised he thought this was a good career move. I can forgive these two though, it was one of their earliest roles and each of them were probably just hoping this would lead to bigger and better things. I can’t forgive established actors like Bob Saget, Eugene Levy and Cheri Oteri, though. They should know better than to appear in this rubbish. This is an insult to the hilarious original movie’s legacy.